Valentine’s Day is a special fiesta for couples all around the world. A garden is the perfect way to convey love to each other, while creating something beautiful that you’ll be able to enjoy long after the holiday is over. This year, make Valentine’s Day a holiday that you’ll both remember for years to come by putting together your own woodland garden. You can take clues from nature while creating a woodland garden. You can check your surroundings to know which native plants grow in your area and how they grow, as well as how the soil and drainage is. Begin the process of making a woodland garden by choosing a spot. Whenever possible, it is best to choose an area where plants are healthy and thriving. If necessary, test the soil for acidity/alkalinity to ensure that the plants that you choose will thrive. Soil test kits are available at garden centers. Consider the general aesthetic of the area as well. For example, a spot with scattered rocks or a space right near your backyard seating area might work better than a bare patch along the side of the house. Once you have selected a space and determined the acidity/alkalinity of your soil, you can start choosing plants for your woodland garden. These help in providing a natural and relaxed look to your garden. These plants also make landscape maintenance simple and easy. There are three primary categories for flowering plants: early spring bloom, mid-spring bloom, and late spring/early summer bloom. Typically woodland gardens bloom in the spring. 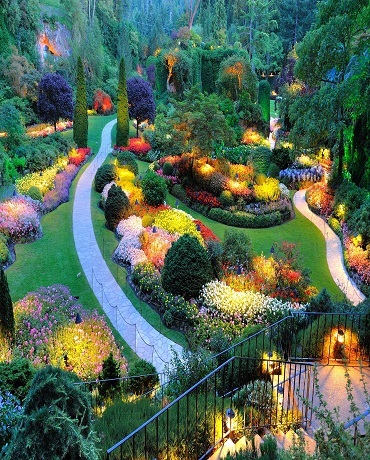 However, you may decide to create a garden that will boast color for months on end. Marsh marigold and Canada lily are two popular, colorful flowering plants for woodland gardens. Contrary to its name, the marsh marigold is actually a member of the buttercup family. As such, it’s not surprising that the yellow flowers closely resemble buttercups. The flowers measure one to two inches in diameter with five to nine waxy, deep yellow petal-like sepals, which bloom from April through June. Canada lilies prefer partial or dappled sunlight, moist to mesic conditions, and slightly sandy or rich loamy soil. The number of flowers on each plant varies from one plant to the next. The floral nectar attracts large butterflies as well as several varieties of Swallowtail butterflies. Moss plants are non-vascular plants, which require damp and shady areas to grow. They grow in colonies that give a carpet-like appearance to your woodland garden. They help in bringing a sense of serenity and calmness to your garden. Annuals are plants that have their entire life cycle within a single growing season while biennials require two years for a full life cycle and perennials come back year after year. Many perennial plants keep their leaves all year round, offering aesthetically pleasing borders and ground cover. As perennials come back on their own, they often require little maintenance beyond basic care to keep them blooming. Red trillium, which also goes by the names Wake Robin and Purple Trillium, produce gorgeous red flowers with three petals and three leaves. It thrives best in rich soil and moist shade. As it tolerates both acid and alkaline soils, it is fairly easy to grow. Other popular woodland trilliums include white, rose, painted, and yellow. Dwarf crested iris is one of the most famous North American natives. It produces small plants with large, flashy flowers. As the plants are small, it’s ideal to position them close to pathways or in other areas where larger plants won’t overshadow them. Bloodroot plants bloom in early spring and need moist and organic soils to grow. They produce white beautiful flowers which have 8-12 petals that grow on leafless stems. They are excellent additions to your woodland garden. Similar to ground plants, shrubs fall into three categories: early spring, mid-spring, and late spring/early summer bloom. It is up to you when you would like to have your shrubs blooming. Sweet pepperbush and sweetbox are both smaller shrubs that are ideal for woodland gardens. Sweet pepperbush is an upright, suckering shrub with scented white or pink flowers that hit their peak in late summer. The blooms resemble bottle brushes and are attractive to bees and butterflies. Sweetbox is an evergreen plant that loves the shade and has a wonderful fragrance when it blooms. The flowers tend to get hidden among the leaves, but you’ll be able to smell them from several feet away. Azaleas are spring bloomers which come in different colors. They require well-drained and acidic soil. Add color and interest to your woodland garden with azaleas, as nothing can be more beautiful that these shrubs. As you fill in the rest of the garden, let nature be your guide. Instead of trying to create a brand new environment, work with the existing elements. For example, if there are already wildflowers in one area, add more plants instead of uprooting them and starting all of the plantings in a new area. You may want to think about adding water features, pathways, and seating arrangements. Ideally the pathways should be wide enough for two people to walk side by side. Top all of your paths with clean gravel. Do you have muddy soil? Build it up to keep the pathways from flooding. This weblog is great, I really like reading your articles. you have got below with this post. I’ll be returning to your web site for additional soon.